Tonight we roasted our first Leg of Lamb. The house smelled wonderful for hours. We seved the lamb with gravy and Homemade Mint Jelly. Preheat oven to 350 degrees-F. Mince garlic and set aside. 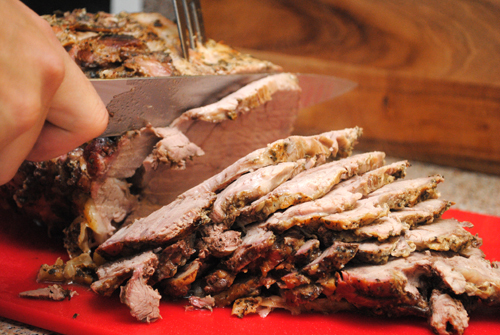 Place lamb in a large roasting pan with a cover. Rub all sides with garlic, then rosemary, then salt and pepper. Roughly chop carrots, celery, and onions and set aside together. Place uncovered lamb in the oven and roast for 1-1/2 hours. Remove from oven and add mirepoix around the lamb. Turn lamb over and place cover on pan. Return to the oven and roast for an additional hour or until center of lamb is 140 degrees-F on a meat thermometer. Transfer cooked lamb to a plate and cover with foil to rest. Pour pan drippings into a heat-safe container or measuring cup and allow the lamb fat to rise to the top. Ladle off and reserve lamb fat in a small saucepan for making a roux. Once all lamb fat has been ladled off, return the pan drippings to the roasting pan, add 2 cups of chicken stock and bring to boil on the stovetop. Be sure to scrape up any drippings stuck to the bottom of the pan. While the liquids are coming to a boil in the roasting pan, slowly add flour to the lamb fat to create a roux, start with 1/4 cup of flour and add more as needed. The roux should be the consistency of a thick paste. Allow the roux to cook over low heat for approximately 4 minutes, stirring frequently. Once the roasting pan liquid comes to a boil, strain into a clean medium size pot and return to heat to once again boil. Whisk small portions of the roux into the boiling liquid giving time between each addition for the gravy to thicken. Continuing adding roux until the gravy is the thickness preferred. Strain gravy before serving. 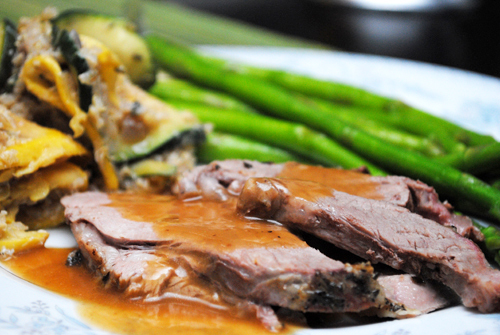 Slice lamb and serve with gravy and Homemade Mint Jelly.